Investor-owned hospital chain HCA Healthcare posted strong results for the third quarter of 2018, easily exceeding analysts' expectations in revenue growth and earnings. The Nashville, Tenn.-based company's revenue jumped 7.1% to $11.5 billion during the third quarter of 2018, which ended Sept. 30, compared with $10.7 billion during the same period in 2017. Net income attributable to HCA grew 78% year over year to $759 million, from $426 million during the same period in 2017. HCA's earnings before interest, taxes, depreciation and amortization totaled about $2 billion during the quarter, compared to $1.8 billion during the same period in 2017. The company's same-facility admissions grew 3.1% during the third quarter of 2018 year over year, while same-facility emergency room visits declined 0.4% during that time. Same-facility inpatient surgeries increased 1.6% year over year, and same-facility outpatient surgeries increased 4.2% during that period. HCA's Chief Operating Officer Sam Hazen said on the earnings call that the third quarter of 2018 marked 18 consecutive quarters in which HCA has grown its same-facility admissions. He also noted that 12 of the company's 14 divisions saw growth in both admissions and adjusted admissions. Considering macro trends in HCA's markets, the company's growth plan, market-share gains and its experienced management team, Hazen said he expects the earnings growth rate in 2019 to be within the range of the company's 2018 guidance for its full-year EBITDA growth rate of roughly 7%. "Typically we do not provide any indication of the upcoming year at this point, but with the transition in leadership, I felt it important to give a glimpse into the upcoming year," he said. Hazen will replace HCA's outgoing CEO, Milton Johnson, who is retiring at the end of the year. After actively participating on 80 earnings calls, Johnson noted Tuesday's call would be his last. "This is a wonderful company with many talented people that are committed to the delivery of high-quality care and operational excellence," he said. HCA continued its robust revenue per admission growth during the third quarter of 2018. That metric, driven by higher acuity patients and prices, was up 3.9% on a same-facility basis year over year. HCA has posted high revenue per admission growth in recent quarters. HCA signed a definitive agreement in August to acquire six-hospital Mission Health based in Asheville, N.C., for $1.5 billion. The deal is being reviewed by the state's attorney general. HCA earlier this year also completed the acquisition of Memorial Health in Savannah, Ga. While Hazen described both as "market makers," he said the two deals took place under very different circumstances. Whereas Memorial Health was in a "desperate situation" and needed capital and management expertise, Mission Health is well managed, has great physicians and is posting strong financial results, he said. "(Mission) viewed the need for sale as being very significant, at least in their thinking, and their board made the decision to go down that path with us," Hazen said. 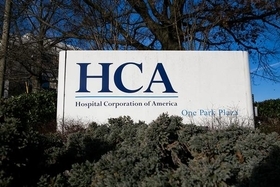 At this point, HCA's primary interest is in working with its existing portfolio, but the company also is looking for opportunities in new markets, he said. HCA's third quarter 2018 results include gains of $6 million stemming from sales on facilities and $9 million in losses on retirement of debt. The company noted it saw a $132 million tax benefit due to the lower corporate tax rate under the Tax Cuts and Jobs Act.